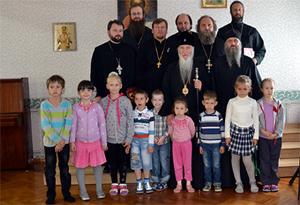 On September 19, 2013 , Smolensky Cathedral and Sunday School were visited by His Eminence Archbishop Mark of Berlin and Germany, along with other clergymen from the Russian Orthodox Church Outside of Russia accompanying him on a visit to Russia. Vladyka Mark, traveling through the Belgorod and Stary Oskol Metropoliate at the invitation of its ruling bishop, His Eminence Metropolitan Ioann, brought the Kursk-Root Icon of the Mother of God “of the Sign” for veneration by the local Orthodox populace. The icon is the main holy image of the Russian Diaspora. As the great icon is making trips to various churches of the metropoliate, Vladyka Mark visits them and learns about the life of their parishes, participates in divine services and flew with the Kursk-Root Icon to the most distant corner of the metropoliate, the city of Valuiki. Today they spent several hours in Smolensky Cathedral, venerating its relics and meeting with parishioners and students of its Sunday school. Vladyka Mark speaks fluent Russian, as do his fellow travelers. It is difficult to tell that they live in America or Europe—except for occasions when their Russian is especially proper, and their choice of words and phrasing. But that is no surprise, for they preserved and inherited the finest of Russian culture, mostly through its language. A long conversation unfolded at the Sunday school, during which the visitors asked many questions, and then began responding to numerous questions themselves.